After capturing Malaya, initially, the Japanese continued the use of British colonial postage stamps and captured stamps were over-printed by the new masters for use. Dai Nippon overprint 1942 was replaced by kanji overprint in 1943 to be in line with the campaign to promote greater Asian identity and the elimination of the Westand use of English language. Stamps overprinted with English texts, 'Dai Nippon - 2602 - Malaya', were replaced by kanji characters, 大日本郵便. Many overprint stamp during Japanese Occupation can be found in mint conditions. 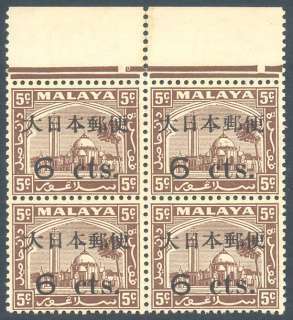 Discussion about Malaya Japanese Occupaions stamps on the internet are available about these kind of stamps and notably that they are easily counterfeited. Special thanks to Hafizal Kun for the kanji script.